Black sage, or salvia mellifera, is native to parts of Southern California and Mexico’s Baja California peninsula, and its use dates back thousands of years. The Native American Chumash people of California long made tea from the leaves of the plant as a medicine to ease painful muscles. They would even soak their tired feet in a black sage tea after a long day of walking. It seems that tribal knowledge has once again held true centuries later. Modern science has shown that the leaves and stems of the plant do contain certain natural chemicals that are known pain relievers. Native American people have also used it in baking and they sprinkled crushed leaves on food, enjoying their minty flavour. It's an evergreen shrub that grows wild along the California and Mexico coasts. It is a small shrub, but can grow up to three feet tall. It has pretty white or light lavender flowers and it is highly fragrant. The plant gets its name from the dark appearance of the mature flowers during times of drought. During prolonged periods of extremely dry conditions, the leaves curl up and appear to die. When watered properly, the plant’s leaves are oblong and slightly woolly and soft, and it is these fine hairs that make this plant so aromatic. Plant your seeds in late December to early February, and do not soak your seeds beforehand as that just turns them into mush. It's a highly durable plant with shallow roots and it can grow in any kind of sandy soils. It prefers full sunshine, but can tolerate some partial shade. The flowers bloom from March to June in the warm California sunshine. Water only occasionally, letting the soil dry out between times. The shrubs need less than 15 inches of rainfall a year, and typically get some of the water they need from fog. Note: I've never grown this variety, but do grow others. Click here for tips. Researchers have found that the oil that comes from black sage has strong antimicrobial properties, which make it excellent for fighting bacteria. Read more about the oil. 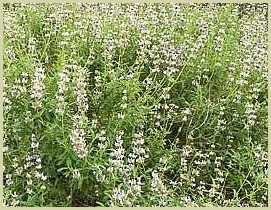 Gardeners this sage for its uses in native landscaping and to help protect against erosion. Its drought-resistance and its fast growth rate make it ideal for building up any desert garden. These shrubs are also popular for drawing bees to your garden and also draws hummingbirds to the garden.